I strive to embrace and appreciate every aspect of the ever entangled web that holds the theatre world together. I am always looking for new opportunities to expand my knowledge and express what I already know and love. After getting married in September 2017, I moved to New York with my husband to start our professional performing and teaching career together. As new residents of NYC, we can't wait to see what the future will hold both on and off stage! Samantha is proud to be the Manager of Programs at ASTEP! ASTEP has been an inspiration for her throughout her entire career, and she is honored to be working with such a remarkably passionate and dedicated group of people, all working to make a positive difference in the world. ASTEP was conceived by Broadway Musical Director Mary-Mitchell Campbell and Juilliard students to transform the lives of youth using the most powerful tool they had: their art. Today, ASTEP connects performing and visual artists with underserved youth in the U.S. and around the world to awaken their imaginations, foster critical thinking, and help them break the cycle of poverty. Samantha was the Program Coordinator for the Arts for Social Justice Program at Santa Clara University. 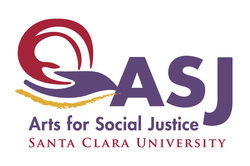 SCU•Presents Arts for Social Justice (ASJ), is a collaborative, interdisciplinary initiative, the mission of which is to raise awareness about critical issues addressing the human condition, inspiring students to engage the world. The Audacity Performing Arts Project, Inc.
Samantha was the Artistic Director for the non-profit "The Audacity Performing Arts Project, Inc." As Artistic Director, she has been teaching acting classes and directing productions for elementary school students throughout the Bay Area.